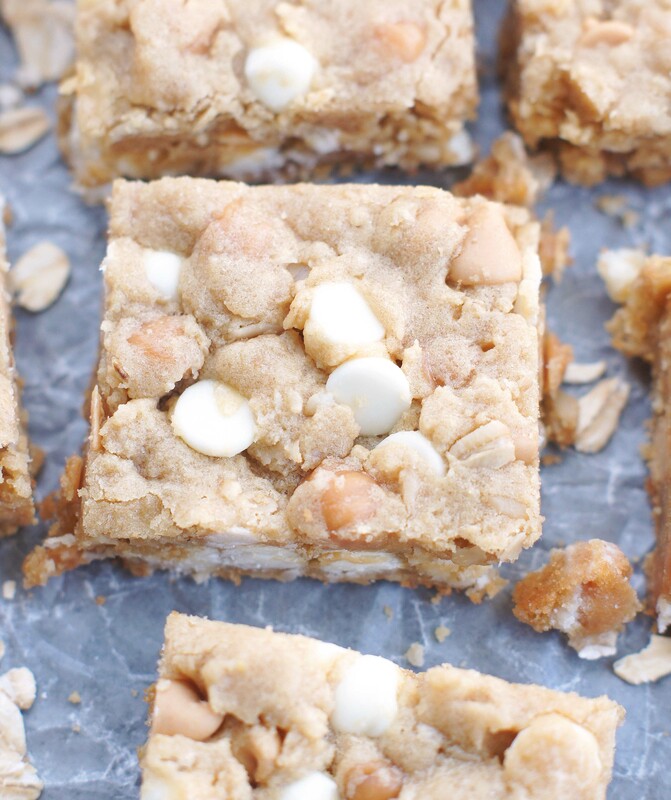 These Loaded Oatmeal Peanut Butter Bars have so much going on inside. Peanut butter, white chocolate chips, peanut butter chips and caramel bits. Soooo good! I learned a really good lesson over the weekend. You don’t need five people making triple batches of rice for you, even if you are planning on feeding a huge crowd. We had my son’s missionary homecoming open house this weekend and I served homemade Cafe Rio. The weather was perfect, the food was fabulous, the desserts were awesome and I had enough rice to feed an army! 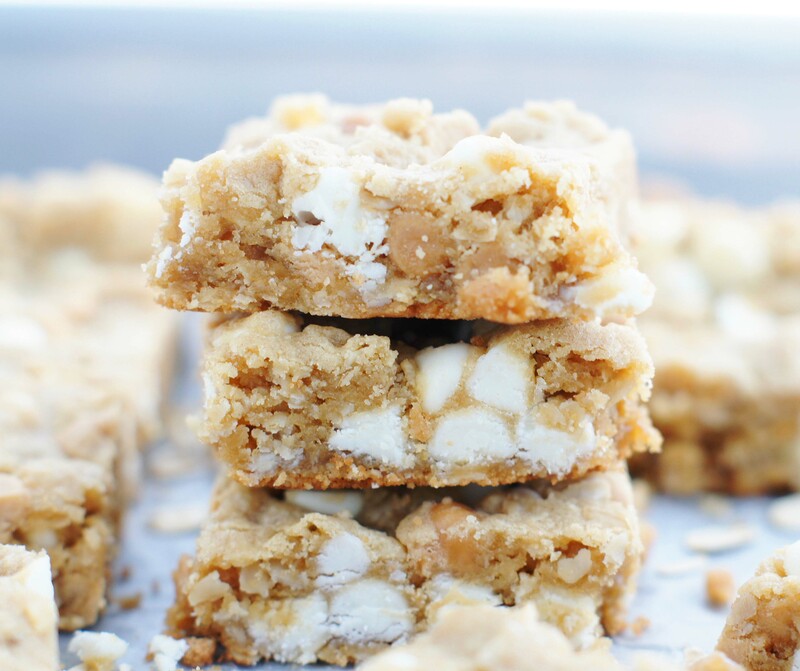 What I’m kind of wishing I had plenty of right now is these Loaded Oatmeal Peanut Butter Bars. Chock full of peanut butter, white chocolate chips, peanut butter chips and caramel bits, these bars have so much going on. Buttery, soft and chewy. . . these are just crazy good. 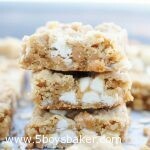 I took the recipe for these Oatmeal Peanut Butter Chocolate Chips Bars and just changed up the add-ins. Definitely a great decision. I made these for some friends and they all completely approved! These are a cinch to make. In case you’ve never seen of heard of the Kraft Caramel bits, they are usually in the chocolate chip section of grocery stores. Mondays definitely call for cookies so you should make these. Preheat the oven to 350 degrees. Lightly grease a 9X13-inch baking pan. In the bowl of an electric stand mixer, cream together the butter, peanut butter, granulated and brown sugars until light and well-mixed and light in color, about 2-3 minutes. Stir in the flour, baking soda, and oats, mix until just combined and then stir in white chocolate chips, peanut butter chips, and caramel bits. Roughly press the batter into the prepared pan. Bake for 15--17 minutes until lightly browned on the edges. The bars will still look pale and undercooked. DON'T OVER BAKE! Remove the pan to a cooling rack and let the bars cool.